Composed by Traditional. Arranged by Sandra Milliken. Renaissance, Sacred, Christmas. Sheet Music Single. 17 pages. Published by Sandra Milliken (S0.433187). 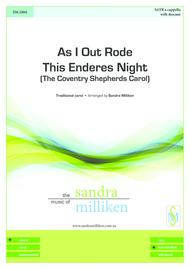 As I Out Rode This Enderes Night is a companion carol to the well-known and very popular Lully, Lullay, also known as the Coventry Carol. Both carols were part of the Pageant of the Shearmen and Tailors. The pageant was a mystery play regularly performed in the English city of Coventry from the early 15th Century until around the middle of the 16th Century. The Pageant also included a third carol beginning with the line Down from Heaven, from Heaven so High. The mystery plays of medieval Europe were traditionally created and performed by craft guilds based in the larger cities. These mystery plays focused on the representation of stories from the Bible, told in the local vernacular rather than in Latin. They told of subjects such as the Creation, the Nativity, the Passion and the Last Judgment. The Pageant of the Shearmen and Tailors depicted the Christmas story, covering events from the Annunciation through to the Massacre of the Innocents. Lully, Lullay refers to the latter event in which Herod ordered all male infants under the age of two, in Bethlehem, to be killed. As I Out Rode and Down from Heaven referred to the angel’s announcement, to shepherds in the fields near Bethlehem, concerning the birth of the Christ child and the subsequent visit by the shepherds to the manger, where they found the baby with Mary and Joseph. 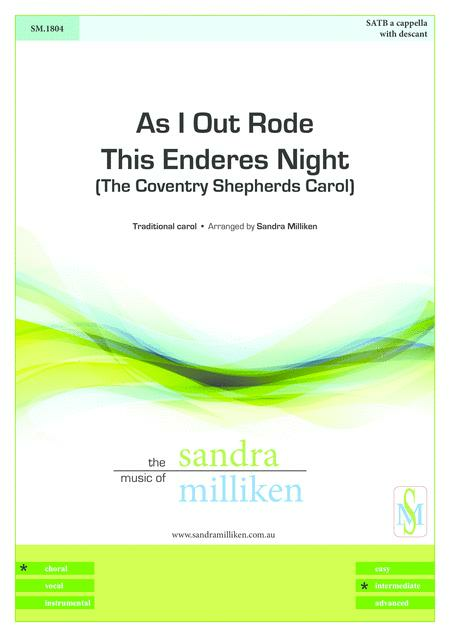 Today, the two shepherds’ songs are often combined into a single carol with the title As I Out Rode This Enderes Night or The Coventry Shepherds Carol. This new SATB-with-descant arrangement (the original was scored for treble, tenor and bass) incorporates an additional three verses, the lyrics of which are an adaptation of the dialogue from the pageant that came between the two songs of the shepherds.